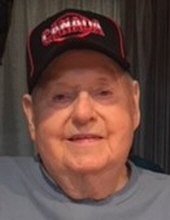 Kenneth A. McKee, 99 of Royal Oak, Michigan died on November 08, 2018, at Beaumont Health System in Royal Oak, Michigan. He was born on July 27, 1919 in Delaware, Ontario. He is survived by his; children, Ken (Anne) McKee, Michael (Susan) McKee, Nancy (Russ) Marshall, Steve (Maria) McKee, Sandra McKee and Carolyn (Rick) Varner; 21 grandchildren; and six great grandchildren. He was preceded in death by his parents, Thomas and Ida McKee; loving Wife Carrie (married for 64 years) and their daughter, Patti Vaughn. The family will receive friends on Sunday from 2:00 PM to 8:00 PM at Sawyer-Fuller Funeral Home, 2125 12 Mile Rd., Berkley, Michigan. A Funeral service will be at 11:00 AM on Monday at Sawyer-Fuller Funeral Home located at 2125 12 Mile Rd. Berkley, Michigan 48072 with Deacon Dan Darga officiating. Burial and military honors will be at Great Lakes National Cemetery, Holly, MI on Thursday, November 15, 2018 at 1:00 PM. To send flowers or a remembrance gift to the family of Kenneth A. McKee, please visit our Tribute Store. "Email Address" would like to share the life celebration of Kenneth A. McKee. Click on the "link" to go to share a favorite memory or leave a condolence message for the family.